Hello again, tmrw here. Sorry to have kept you waiting. Fear not, though – cos we’re back with Volume #18. We think you’re going to like it! 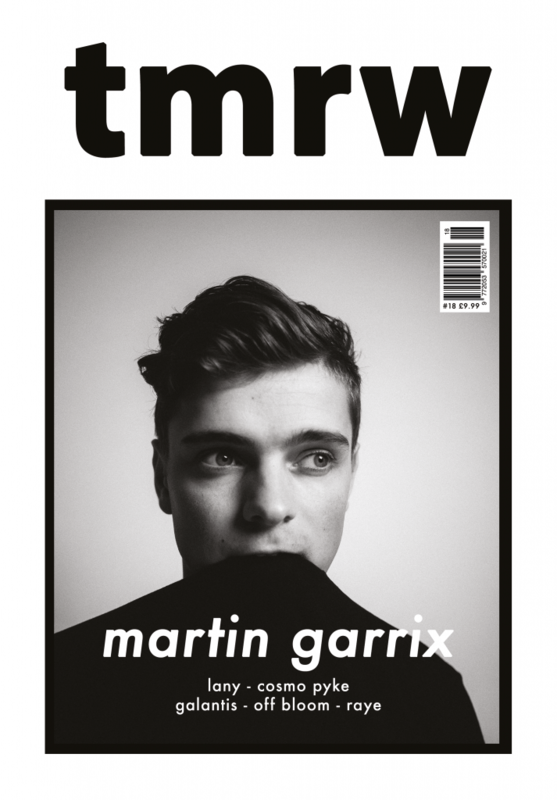 Gracing our cover is the world-conquering Martin Garrix – we sat down with the 20-year-old wunderkind to talk work, play and why, in 2017, DJs are the new popstars. As well as that, we’ve got exclusive, in-depth interviews with R&B extrovert Raye, Swedish dance music pioneers Galantis, Off Bloom, Lany, and the formidable Cosmo Pyke. As if this wasn’t enough, we’ve got enough culture, fashion, food and photography to keep you at it for weeks. There’s an ode to the thrilling recklessness of punk culture, a tribute to George Michael’s legacy, alongside a defence of Norwich (yep, Norwich) and its bustling, independent lifestyle. Come and join the movement. It’s a lot of fun. Our web-store is the only place you can purchase a copy of tmrw. Order now.